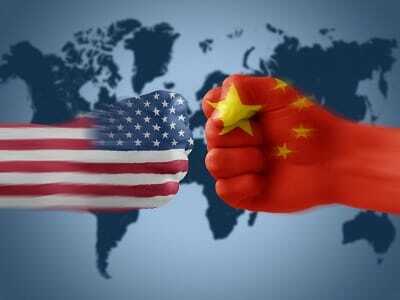 Late last month, the World Bank predicted that China would very soon surpass the United States as the world’s biggest economy. It culminates a striking, decades-long rise to prominence for an officially communist country, and could be seen as perhaps embarrassing to the ideals of free-market capitalism. But let’s be real: The truth is that the economies of China and the U.S. are well past the simple labels of “communist” and “capitalist”; each has grown to be much more complex, with both operating in shades of gray. For example, consider that as China has adopted more business-friendly policies, the United States has become more authoritarian and interventionist. So it really is no wonder they China is on an upswing and, in spite of headlines bravely making the best of it, here in the United States, we are… not. However let’s not anoint China as the new economic leader so quickly; the immediacy of them actually overtaking the U.S. is all in how you read the numbers and define terms. The World Bank’s numbers come from a PPP analysis, or “purchasing power parity” across currencies and markets. Adjusted, China’s per capita GDP is $10,000 vs the U.S.’s $49,800. China has 20% of the global population and we only have 5%, so they have more human capital to eventually produce a bigger GDP. But if the Chinese standard of living ever caught up with that in the United States, well, you could see how we would be left in the dust economically. Let’s look closer at this point on standard of living: If China continues to back away from communist principles that put human beings in the liability column of the economic ledger, rather than in the asset column, they are certain to overtake the U.S. economically. After all, we are doing the opposite, to our economic detriment. Communism sees a strong centralized government as caretaker and manager of the people and the economy. Thus, each added person is an added burden to the government, one more mouth to feed, clothe and house. Seen in that light, mandates like the ruthless one-child policy make sense. However, China has been backing off that rule for some time now, and continues to do so. Their recent growth spurt seems to have helped them see human beings not just as consumers, but also as producers. And as the Chinese people have received more freedom, they have become more productive – as all people do. As the economic benefits continue to roll in, maybe China will allow its people to act in even more capitalist ways. Capitalism sees individuals as creators of value, responsible for themselves with a minimal role for the state. But more and more Americans are becoming dependent on the welfare state. More and more, Americans are demanding increased handouts and government control of business. So as China slowly eases away from Communism, many of the government programs in the U.S. are actually moving towards it. If these trajectories continue, that prediction by the World Bank is a slam dunk: China will ascend and we will descend. All this said, China’s ascent is not a forgone conclusion. If they’re truly on an upswing, they still have a ways to go. And it is not clear that the growth they have been experiencing recently is sustainable. They are facing a massive housing bubble situation that would put ours in 2008 to shame. An enormous amount of that growth has been debt-fueled, and the over-investments are well beyond what the market can bear. That is demonstrated by the massive housing projects that are brand new – never-occupied ghost towns like Hangzhou. Total debt in China is now twice their GDP. Still, in 2011 the World Bank estimated that China’s economy was 87% as big as ours, and only $2 trillion behind us in simple GDP – $13.5 trillion versus $15.5 trillion for the U.S. So how is this all going to play out? It’s of course impossible to say for sure: China could deftly navigate around these significant red flags and quickly become the next global economic power, or all those debts could suddenly become due and they would face widespread economic disaster. In an honest moment, we bet most Chinese bureaucrats would admit to the uncertainty swirling around their economy. But in the same breath, they would continue to cite the massive stockpiles of gold they’ve been hoarding as an insurance policy. If economic disaster were to strike their nation, that’s some real peace of mind to fall back on.